Lucy and Elizabeth write about their thoughts on the benefits and concerns associated with Ecotourism, a rapidly expanding industry, which ARCAmazon will utilize in order to conserve the Peruvian Rainforest. As government officials construct the Estrada de Pacifico, an extensive highway plan which extends from Brazil through the rainforest to the coast of Peru, many environmentalists are concerned about the effects the road will have on the Amazon. Constructing such a road will lead to higher rates of deforestation, which already destroys more than 150 acres lost every minute of every day. The highway could also increase the threat of gold mining illegal logging extraction of the forest resources there is also the threat of farmers entering the forest and using slash and burn agriculture, to destroy mass amounts of trees and natural habitats, to create nutrient rich soil for farming. Without a plan for conservation and protection the future of the Amazon rainforest remains in jeopardy. By utilizing the resources of scientific experts, and collaborating with community members organizations like ARC Amazon can play an effective and significant role in the protection of the rainforest. It is crucial that ARC Amazon is aligning themselves in the best way possible both ethically and environmentally as they introduce tourists to the Peruvian jungle. Ecotourism provides ARC Amazon the credentials to be an environmentally friendly tourist destination, which will appeal to both environmentally concerned enthusiasts and explorers alike. 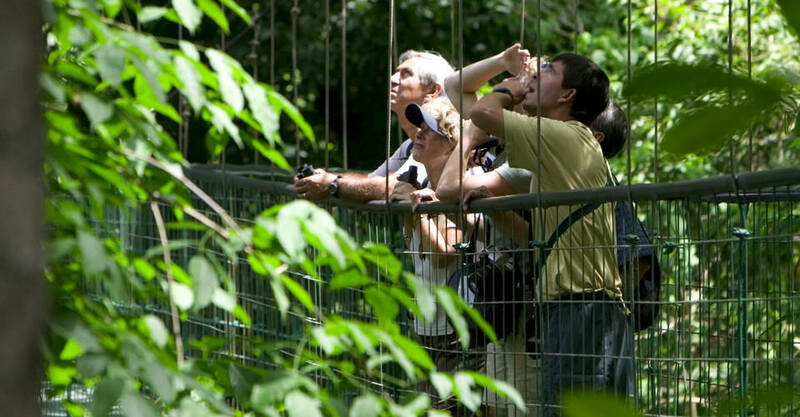 To advertise as an ecotourist destination, It is essential that ARC Amazon creates sustainable profit while educating and promoting the values of conservation and research. Fortunately the Amazon rainforest provides numerous opportunities for ARC Amazon to fulfill the criteria of being an ecotourist friendly centre. It is essential that tourists have a clear understanding of their impact, and have clear expectations of their journey in the amazon. ARC Amazon needs to provide a wonderful, exciting experience for their guests. The most common misconception is that people expect to see the images they view online in real life because that is what they buy. There is a sociological term that perfectly describes this phenomenon: the Tourist Gaze. The “tourist gaze” is explained by John Urry as the set of expectations that tourists place on local populations when they participate in heritage tourism, in the search for having an “authentic” experience. That search for the authentic experience is most often blurred not only by filters, but simply by the idea of recreating ideals or preconceived notions of the place (think Abbey Road, leaning on the Tower of Pisa, or pinching the Eiffel Tower). Tourists end up shifting their gaze from the nature they paid to see to the “takeaways” they bring with them back home and share with the world on social media. In essence, modern Eco Tourists pay to experience nature and in the end they end up paying for the pictures they posted on Facebook and Instagram. The commodification of places has lead to the detached function of such communities. As soon as a tourists’ expectations are superimposed on a place, the credibility and purity of a place is compromised. The educational, adventurous, and non-consumptive aspects of Ecotourism are lost because tourists are more concerned with what they can take back rather than what they can contribute. Ecotourism in and of itself is a paradox in the sense that it contradicts itself as it attracts visitors that want to learn and people who want to have an authentic experience, but compromises the integrity of the environment in order to give tourists the best experience. Infrastructure damages the land they intend to protect. The revenue and tourist taxes exist in places where this kind of destruction occurs to compensate for the loss of flora and fauna. But who places a price on nature? Shouldn’t it be priceless? As millennials living in a cyber obsessed world, we are concerned that our perceptions of Peru will impact this once in a lifetime experience. Our class should be aware of the biases that are associated with traveling in the tropics. Before we venture to Las Piedras, it is essential that we are equipped with the knowledge that we cannot hold unrealistic expectations of what our experience should be. Our anticipations cannot be steadfast, and we must remember to be flexible during our travels. The reality of the rainforest is unpredictable. We cannot write our own stories, but instead allow the forest to guide our journey. The real question is how much is too much? We want people to come, but how much are we willing to give up? This is an important post. It seems to me that ecotourism is often treated as the end-all-be-all of conservation. True, it has important benefits. It can keep large amounts of habitat in a semi-natural state while providing income for local residents. But when ecotourism isn’t done right it can have very negative consequences, as you pointed out. I would add to your post that unethical tourism practices can change animals’ behavior in sometimes dangerous ways. The first confirmed, unprovoked, and fatal attack by a jaguar on a human likely took place in the Brazilian Pantanal in 2008 (I think). I’ve read in multiple papers that investigators think the practice of baiting jaguars for photo ops played a role in that tragedy. Irresponsible tourism doesn’t just hurt wildlife, it can hurt people too. Again, ecotourism can have many benefits for local ecosystems and economies. But it has to be done responsibly.